Dutch yard Van Der Valk has delivered the fourth model in its Continental Three series, the 26 metre motor yacht Nicostasia. 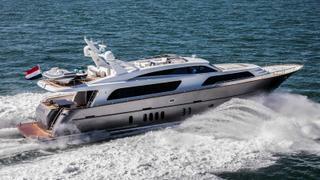 The aluminium yacht was styled inside and out by Guido De Groot and features naval architecture by Ginton. He added that the large windows on this raised pilothouse model will make for an exceptionally bright interior with clean, straight lines to frame the open spaces. En-suite accommodation for all eight guests is situated below decks with an owner’s cabin spreading across the entire 6.2 metre beam. Three guest cabins — two doubles and one with bunk beds — complete the layout of this area. Meanwhile, the spacious superyacht sundeck on the new Van Der Valk Continental Three features an outdoor helm station, sunloungers, U-shaped seating, cocktail bar and storage space for a 4.2 metre tender. 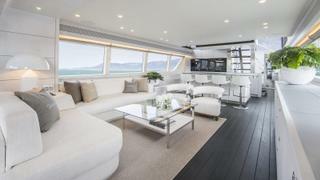 Other premium features on board include automated sliding doors and a Bowers & Wilkins sound system. Power comes from a pair of 1,502hp MTU 10V 2000 M93 engines for a top speed of 25 knots, while a Seakeeper 26 gyroscopic stabiliser system ensures a smooth cruising experience. Other projects recently launched by the Dutch yard include the 27 metre Anemeli and the 26 metre Forum, both of which were launched in 2017.